Building cloud based, customer centric, user-friendly, reliable, scalable, and value focused technology strategy for the start-up. Implemented Office 365 & Exchange online, and currently evaluating Rights Management service for email encryption. Managing contracts for supporting out web strategy, including the delivery of our mobile ready splash page, official online presence site, hosting, marketing analytics, leads generation, SEO, etc. Monitored $10M overall IT capital budget. 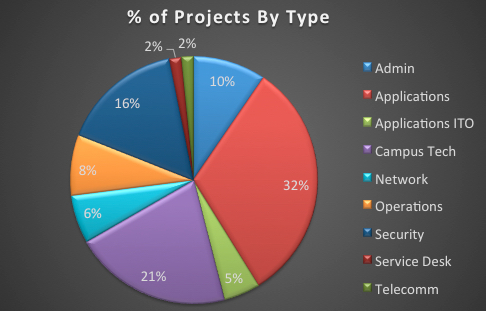 Directed corporate projects for IT operations and Application services. Built from ground up, directed, and mentored a dispersed team (work from home and/or different sites) of 20 employees and contracted vendors. Built 5-year strategic plan with emphasis on cost savings, increasing business value and improving business stakeholder’s synergy in operations and technology areas. Helped develop strategy to move applications to a secure, private cloud - $3M in savings as compared to previous downtimes and hardware costs. Developed and successfully managed yearly cost center and capital budgets within plan. $3M. Hired system trainer and created strategy that increased number of user attendance. Started business process team to help with the business operations and analysis gap and started a centralized business process repository. Security: Ensured company's security by developing detailed best practice policies that emphasized firewalls, VLANs for traffic segregation, port restrictions, properly documented server list including ip addresses, joint domains, antivirus, VPN for all traffic tunneling, email filtering, rules for encrypting, file sharing, passwords requirements, etc. Office 365: negotiated contracts with multiple license types and helped oversee the migration of Exchange to the online environment. 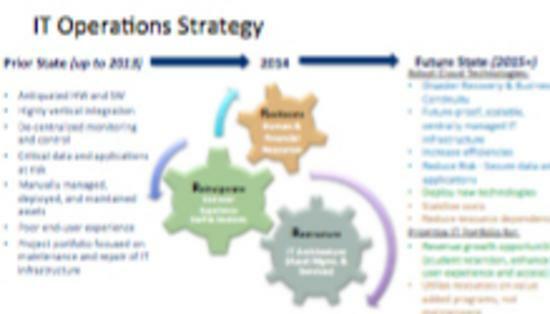 Disaster Recovery: Helped develop short term and long-term strategy for our disaster recovery plan. Helpdesk: evaluated and implemented Help Desk system. Created process & procedures, hired and trained employees and established KPIs. Change Management: Built the company's 1st change management process; member of the change advisory board. Directed replacement of LMS system from Blackboard to Canvas and guided integration changes to the main system of records. Directed rollout of MS Live.edu emails integrating with active directory. System upgrades: Established companywide, repeatable, seamless processes and testing procedures, which helped avoid $1M cost per year in possible down time and regulatory compliance issues. Experienced working with senior leadership to analyze and assess alignment of the organizations strategic, business, and technological assets. Engaged with executive level stakeholders on issues concerning employment of advanced technologies in support of strategic initiatives impacting the entire enterprise. Redesigned testing, verification, and sign-off process with business stakeholders. System Security Access -- Provided data architecture expertise, including best practices for standardization of access control and metadata requirements · Developed a security matrix to facilitate executive review/understanding/sign off of the most important system areas, pointing out processes that could affect system performance. Kaplan Commitment -- President’s initiative to allow customers to try out Kaplan for a preliminary period of time without incurring any financial obligation · Completed SWOT analysis to identify opportunities and impacts to current business processes · Analyzed developed processes to automatically identify the student eligibility. Supported systems of record utilizing SQL technologies. Trained and provided mentoring to levels I and II analysts. Performed troubleshooting front-end and back-end of proprietary information system. Managed other Financial Aid officers on daily processing work and Title IV questions, and managed various KPIs that resulted in improved starts. Researched Microsoft businesses acquisition and reported their investment failures, revenues, and marketing outlooks for competitive advantage analysis · Utilized Lotus Notes software. IT leaders should be viewed as thought and change leaders within their organization. The business must drive IT through a natural partnership. IT Strategy snippet - 2013 through 2015. This is a quick, visual example of how projects were handled in my IT department. Please note the largest percentage is rightfully due to the fact the "Applications" area consisted of business applications with direct impact in business operations and customer facing technologies. 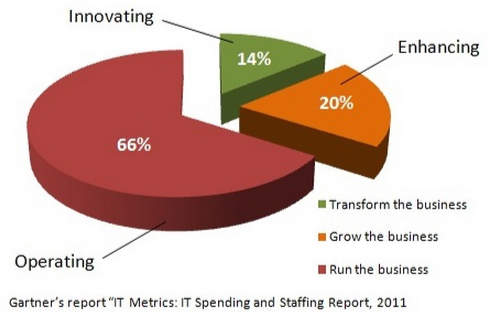 I have used Gartner's "Run, Grow, Transform" strategy to benchmark IT budget and help align it with business needs. 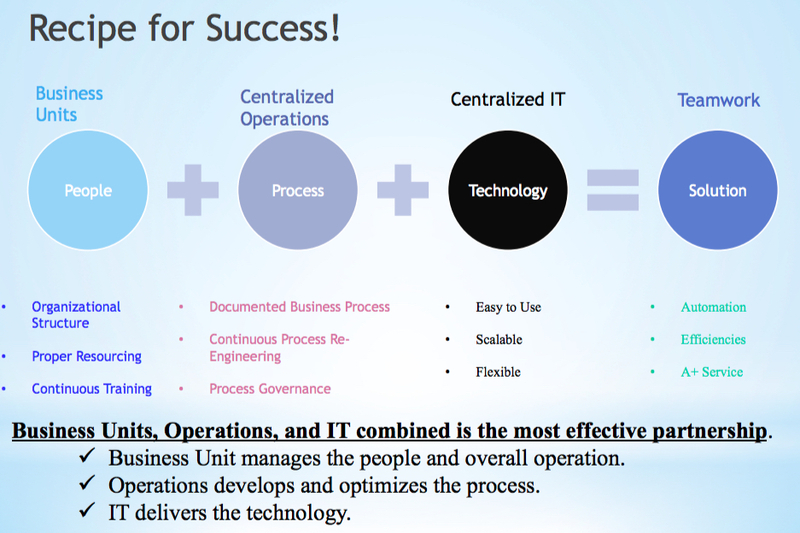 Contract Management - IaaS, SaaS, Support & Maintenance, etc. Risk Management - Risk register. Strategic Management - Aligning IT with business needs. Data Analysis - SQL Server, Data Warehouse. MS SQL Server, SSRS, Tableau, MS Office (full), Office 365, Exchange Online, MS Project, MS Visio, Sharepoint, Clarity, Mercury, Daptiv, CRM (Salesforce, MS CRM), Magic Ticketing, Crystal Reports, IIS, Web 2.0 technology-XML-Web Services/APIs, HTML, Service Desk+, Confio Ignite, PBX/VOIP systems, CampusVue, BlackBoard (LMS), MS Dynamics, MS Business Portal (HR), Prophix (Finance), Canvas (LMS), Docusign, Genius SIS, Schooldocs, Yardis (Real Estate), UltiPro (HCM,) MindMeister, BaseCamp, MindMap, OneNote, etc. Women in Technology : Volunteered to speak to students at Margate Middle School about technology roles. SIFE & Hollywood Hispanic Society : Helped ESL adults build resumes to prepare for employment.